This 48" PVC Vinyl Raincoat from Neese delivers extreme value. Printed title on back clearly identifies you. Features ventilated back and underarms for extra comfort. I usually wear a 2X size in Tall but sometimes you take what you get - but - not with this raincoat. Ordered a 3X - way too small, especially in the shoulders and sleeves. Next, ordered a 4X - still too small in the shoulders and the sleeves seemed even shorter. Too much time & expense to return them so I donated them. Great for the occasional Southern California Monsoon (when you need it you need it!). I just order the plain and put my ANSI safety vest with my agency markings over it. If you are wearing a gun belt, body armor, jacket etc. order it two sizes larger than your normal jacket size. For the price you can't beat it! 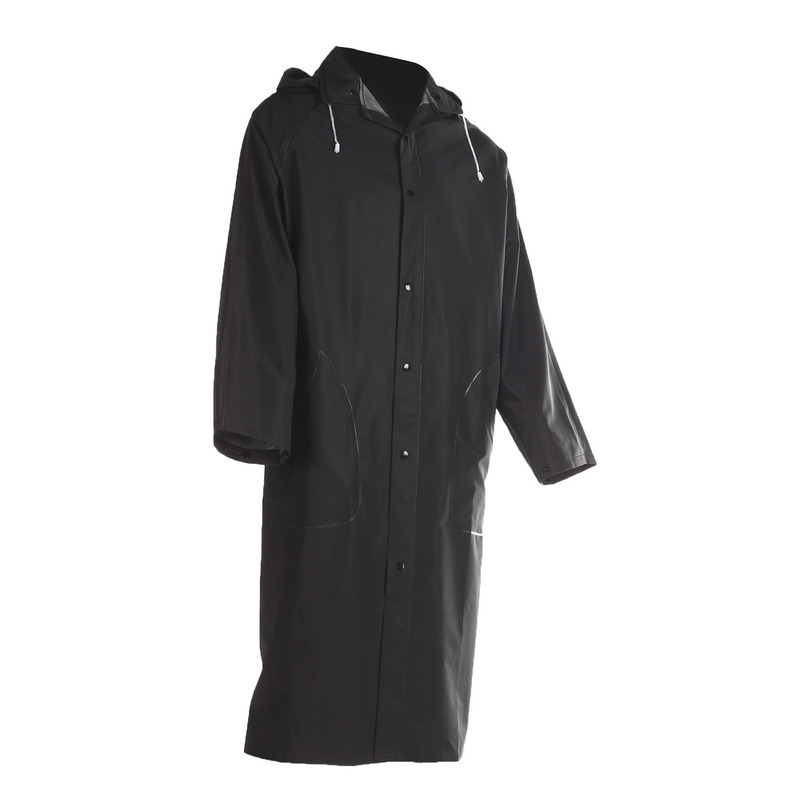 Finally, a raincoat made out of material heavy duty enough to stand up to police fieldwork! I only have two issues: 1. The plastic snaps aren't as heavy as they need to be. 2. The size is narrow in the shoulders. If like the rest of us officers you tend to have wider shoulders, oversize 1 to 2 sizes larger in order to cover your uniform and duty gear! Ordered a few for myself and co-workers and we all had to go up at least 1 full size. Some even had to go up 2 sizes. I think it is a good value just recommends getting a size or 2 larger than you normally wear. For the price, you can't beat it. They wear down eventually and need to be replaced. Be sure let them hang dry after use. I would like to see some length added to keep water from entering my boots. This coat is a great value. I ordered the XL and it barely fit me, if you intend to wear it over other bulky clothing get a size bigger than you think you need. Q: Is it possible to get this item without the silkscreen? A: Item S48 153 is a similar raincoat. No Silk screen.